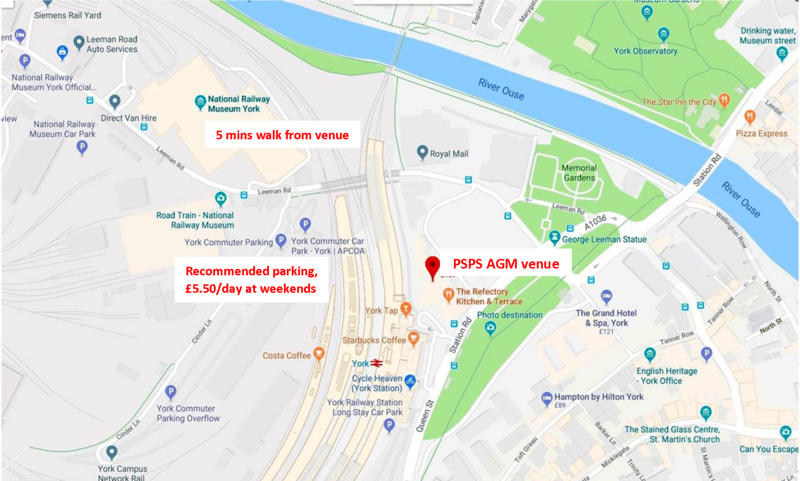 The Thirty-First AGM of the PSPS will take place on Saturday 17th November at 1:30pm in the Crown Room, Principal Hotel, York, YO24 1AA. The room will be available from 1pm. The map below shows the close proximity of the Principal Hotel to York Station and the National Railway Museum. Minutes of the 30th AGM held on 18th November 2017. Reports of the Council of Management and Reporting Accountants and the Society's Financial Statements for the year ended 31st December 2017. Note that John Anderson and Peter Morley have been re-elected and elected respectively unopposed to the Council of Management. To appoint Peter Walker FCCA as Reporting Accountant to the Society for the ensuing year, and to authorise the Council of Management to fix his remuneration. Following the conclusion of the formal business, there will be a progress report on the Development Plan 2018-2021 and an Open Forum for members to raise questions and topics for discussion. The AGM will be followed by a presentation of 'Clyde Steamers in Rare Archive Film, 1930s to 1970s' by Iain Quinn. Only PSPS members may attend the formal business part of the meeting but non-members are very welcome to attend the presentation of archive film. 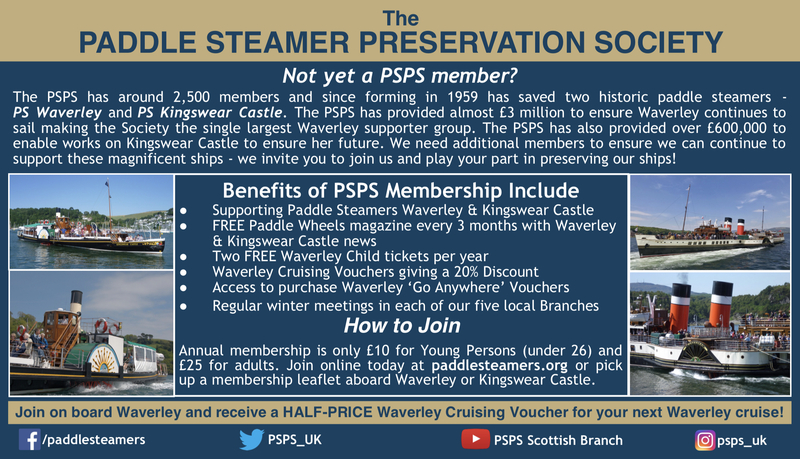 The 2019 PSPS calendar will be on sale at the meeting priced at just £8. The calendar opens up to A3 in size and has been produced to mark 60 years since the Society was founded in 1959. It features several paddle steamers including Waverley, Kingswear Castle, Caledonia, Cardiff Queen and Freshwater.